702 Motoring's feelings the Scosche GM5201AB Factory Integration Adapter. You bought a 2010-up Camaro — great car, but its console makes it tough to upgrade the factory radio. The Scosche GM5201AB integration adapter replaces your Camaro's dash panel, so you can install a single- or double-DIN car stereo. Aftermarket radio dash kit. 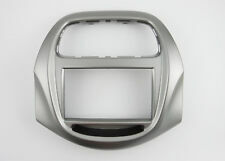 Replaces the OEM radio bezel and allow the installation of a aftermarket radio. Installers enjoy an unmatched ease of installation. Accommodates Single or double DIN radios. Factory-matched radio dash kit. Fully integrated kit includes. PONTIAC G6 2006. PONTIAC G6 [w/ Drivers Information Center] 2007. PONTIAC G6 [w/ OnStar] 2007. PONTIAC G6 [w/o OnStar] 2005. PONTIAC G6 [With. Interactive LCD Display that retains OnStar, RAP, and the factory Drivers Information Center. ]. ISO DIN radio provision with pocket. AUTHENTIC GENUINE RADIO DASH KIT. Custom design retains the factory climate vents in their original location. Antenna Adapter. (all models) 1991-1994. Firebird 1982-1992/1985-1992. Bravada 1991-1994. S-15 Pickup 1986-1994. Jimmy 1986-1994. S-10 Pickup 1986-1993. S-10 Blazer 1986-1994. Compatible with 2015 - and Up Chevrolet Trax. Double DIN radio dash kit for double-din stereo. Painted black to match factory dash color and texture. ISO DIN radio provision with pocket. Chevy Silverado/GMC Sierra 1500 2014-up. Chevy Silverado/GMC Sierra 2500/Sierra 3500 2015-up. DoubleDIN radio provision. Aveo hatchback 2007-2008 Metra patented Snap In ISO Support System Oversized under radio pocket Recessed DIN mount ISO trim ring Contoured to match factory dashboard . The black textured finish matches your factory dash. Professional Installer Series Turbo Kit Designed to mount precisely to OEM radio mounting positions WIRING & ANTENNA CONNECTIONS (sold separately) Wiring Harness: 70-1858 – GM harness 1987-2005 Antenna Adapter: 40-GM10 – GM antenna adapter 1983-2013 . • We strongly encourage professional installation of any electronic devices. • Warranty service will be refused if serial number of unit does not match that of serial number sold by us. Metra patented Quick Release Snap In ISO mount system with custom trim ring DIN opening High grade ABS plastic contoured textured and to compliment factory dash Comprehensive instruction manual All necessary hardware included for easy installation WIRING & ANTENNA CONNECTIONS (Sold Separately) Wiring Harness: 70-9003 – European wire harness Antenna Adapter: 40-EU10 – European antenna adapter . Interactive LCD Display that retains OnStar, RAP, and the factory Drivers Information Center. CHEVROLET MALIBU 2004. CHEVROLET MALIBU CLASSIC 2008. CHEVROLET MALIBU CLASSIC W/ PREMIUM SOUND 2008. CHEVROLET MALIBU MAXX 2007. For CHEVROLET Cruze 2009-2012 (Black). Car Stereo Panel Plate Fascia Facia Surround Radio. Adaptor Trim/Car Radio Installation Trim Fascia. Car stereo showed in the picture is not included, just the Stereo Panel. BRAND NEW, NOT REFURBISHED, 3 YEAR WARRANTY, FAST SHIP! 2012 - 2016 Sonic. Installation Dash Kit for Single or Double DIN Headunits. Gapless fit between the dash and the kit. Painted to match factory dash color. Dash Kit Color Black. Installation Kit Specifications. Estate Wagon 1984-90. Coupe De Ville 1985-93. Delta 88 1986-88. Safari Wagon 1987-89. Touring Sedan 1988-93. Van (Full Size) 1988-95. Van (Full Size) 1988-00. Eighty Eight 1989-93. Chevy Equinox / GMC Terrain 2013-2017 (with color display). ISO DIN radio provision with pocket. ISO DDIN radio provision. Antenna Adapter. Axxess interface and harness included. Warranty would be invalid for following conditions. Designed specifically for the installation of double-DIN radios or two single-DIN radios. We are committed to providing you a quality product at the lowest prices possible. Solstice 2006-2009. G6 2009-up. If you’re a 5th gen owner with a love for car audio and/or technology, you know, the struggle is real. Everything included, installers enjoy an unmatched ease of installation. New Dash Kit for 5th Gen Camaros. All products are fully covered by Sourcing, L.A. LLC.'. All DOA must be reported to Sourcing, L.A. LLC. Subwoofer enclosures are not covered by Sourcing, L.A. LLC.'. Burnt voice coils. All defective products will be covered under warranty except the following. Chevy Malibu / Malibu Maxx 2004-2007. Pontiac G6 2005-2008. Pontiac G6 2009 (5th digit of VIN must be a G H or M). Chevy Cobalt 2005-2006 (only used to retain OnStar). Chevy Malibu Classic 2008 . Retains OnStar. High-gradeABS plastic with factory texturing to the dash is needed. Specially designed forISO mount radio withISO trim ring. Radio side support is provided by our patented Side Arm Support System. Quick conversion fromDIN to 2-shaft with snap-in style shaft supports. 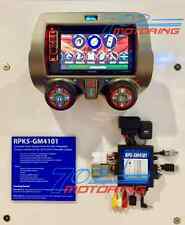 DOUBLE DIN RADIO KIT - GM Multi-Kit 2006-Up. Captiva Sport 2012-Up. H2 2008-2009. XL7 2007-2009. Vue 2008-2010. Outlook 2007-2010. Yukon 2007-2014. Sierra 2500/3500 2014. Faceplate Carry Case Included. Back to Top AP6.0. Playback from CD, CDR, CDRW of MP3 & WMA. Playback from 32GB USB of MP3 & WMA. A2DP MP3 Audio Playback from Enabled Device. Silverado 3500 (chassis cab) 2001. CK Pickup 1995-1998. Escalade 1999-2000. Yukon Denali 1999-2000. Yukon 1995-1999. Suburban 1995-1999. Installation Dash Kit for Single or Double DIN Headunits. Includes a storage pocket below the radio for single DIN mounting. Accommodates ISO Single DIN mount. Accommodates ISO Double DIN mount. For Chevrolet Camaro vehicles. Tundra 2007-up. Painted high gloss piano black to match factory finish. 99-8220CHG= Charcoal High Gloss. 99-8220HG= High Gloss. Wire harness OEM quality ABS plastic. We are committed to providing you a quality product at the lowest prices possible.